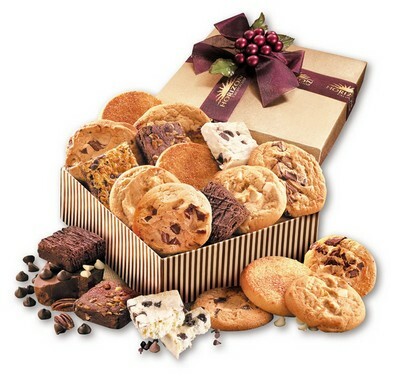 Dimensions: 7 3/8" x 7 3/8" x 2 1/4"
Baked goods should be enjoyed within 2 weeks; or stored in a freezer for up to 3 months. Price includes imprint foil-stamped in gold on sheer burgundy ribbon. One-dozen thick and chewy, home-style cookies and brownies, made from scratch! Two Snicker-doodles, two White Chocolate Macadamia cookies, and four Chocolate Chunk cookies; along with four fudge-like brownies: Double Chocolate, White Chocolate Raspberry, Chocolate Pecan, and Chocolate Butterscotch Coconut. Guaranteed to thrill every recipient! These delicious treats are carefully nestled into an elegant gold-striped gift box and tied with sheer burgundy ribbon, foil-stamped with your logo. Go ahead and make their day!